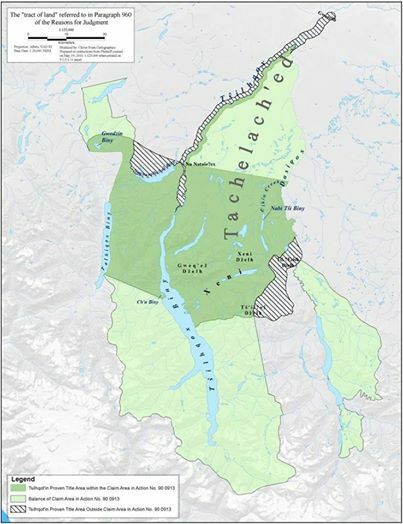 This map shows the area which has been declared aboriginal title lands of the Tsilhqot'in. In 1989, the Tsilhqot’in people stopped foreign-owned logging operations in their Brittany Triangle. The argument over logging carried them through courts, where the provincial and then the federal governments insisted that it was perfectly legal to license logging operations under the provisions of BC’s Forestry Act. That’s why, when Chief Roger William and the Tsilhqot’in Nation launched an action against Canada, they argued that the provincial Forestry Act could not apply in the area because these were aboriginal title lands – not crown land. The Tsilhqot’in have their declaration of aboriginal title lands. It is the only place in Canada which is recognized as such. Aboriginal title has never been recognized on the ground, with an address; and until this time the governments have acted as if it were a hypothetical concept. Chief Justice Beverly McLachlin wrote the reasons for the unanimous decision and has given much definition to aboriginal title. She has said that it will be treated the same as “lands reserved for the Indians,” under the Canadian constitution. She said it doesn’t make sense that the provincial forestry regulations should not apply on aboriginal title land, because that would be inconvenient. She notes that both the federal and provincial governments are happy to allow the province to keep regulating over “lands reserved for the Indians,” which now includes aboriginal title lands, even though it is a strict division of powers in the Canadian constitution which forces only the federal government to have power over “Indians” and their lands. The federal government does not have a forestry act. The Tsilhqot’in do. However, the ruling was written for the governments, as if the Tsilhqot’in people had played their part by raising this question of interjurisdictional immunity between the federal and provincial powers, and now that the question has been answered they can go back to being “consulted” and “accommodated” as to whether activities carried out under the Forestry Act are infringing their rights. Now, with title, the court has called their rights in the title area "the right to proactively use and manage the land.” The BC Forestry Act applies insofar as it does not infringe Tsilhqot'in aboriginal rights, now including their aboriginal title. The governments view aboriginal title as a form of aboriginal right. Indigenous Peoples in general view their rights as a function of their titles: they are the peoples of the land, their rights to it and to their own governance flow from that fact. The Canadian approach removes the connection between the peoples and the lands, saying effectively that modern aboriginal rights are provided by the grace and recognition of Canada, not by the lands and waters which reflect millennia of title and free exercise of rights. "In summary, Aboriginal title confers on the group that holds it the exclusive right to decide how the land is used and the right to benefit from those uses, subject to one carve-out — that the uses must be consistent with the group nature of the interest and the enjoyment of the land by future generations. Government incursions not consented to by the title-holding group must be undertaken in accordance with the Crown’s procedural duty to consult and must also be justified on the basis of a compelling and substantial public interest, and must be consistent with the Crown’s fiduciary duty to the Aboriginal group." The significance of this passage is that it is saying two things which cannot both be true. If people who have aboriginal title can exclusively decide how land is used then it can’t also be that Canada can decide to infringe on that power when it has a “compelling and substantive” reason based on the interests of Canadians. "The characteristics of Aboriginal title flow from the special relationship between the Crown and the Aboriginal group in question. It is this relationship that makes Aboriginal title sui generis or unique. Aboriginal title is what it is — the unique product of the historic relationship between the Crown and the Aboriginal group in question. Analogies to other forms of property ownership — for example, fee simple — may help us to understand aspects of Aboriginal title. But they cannot dictate precisely what it is or is not. As La Forest J. put it in Delgamuukw, at para. 190, Aboriginal title “is not equated with fee simple ownership; nor can it be described with reference to traditional property law concepts”. Justice McLachlin does not mention asking the Tsilhqot'in for a definition. By continuing in the Canadian tradition of "not knowing" what aboriginal title is, the Supreme Court has indulged the governments yet again: they can keep guessing and keep innocently not knowing when they infringe it. The "special relationship" might be more aptly referred to as an illegal occupation. This case has put aboriginal title in place along with all aboriginal rights: it is controlled and regulated by Canada; interpreted and defined by Canada; it can be infringed by Canada and by the provinces. Aboriginal title land can only be alienated, or sold, to the crown. The trouble with the legal process of justifying infringement of aboriginal rights, with waiting helplessly until “the government has discharged its duty,” is that the government has a proven track record of doing the damage first and then only later are they taken to court to prove what happened. So if the government does not comply with “its procedural duty to consult with the rights holder and accommodate the right to an appropriate extent at the stage when infringement was contemplated;” or is unable able to show that “the infringement is backed by a compelling and substantial legislative objective in the public interest;” or fails to determine that “the benefit to the public is proportionate to any adverse effect on the Aboriginal interest” – we will have to wait until the damage is done and a Canadian court reveals the answer. The ruling found that the province had unjustifiably infringed the Tsilhqot'in aboriginal rights when it authorized logging in the title area; the province shares the same duties to aboriginal peoples on aboriginal title lands that the federal government does, with respect to consultation and accommodation. A great deal of clearcut logging has impacted the title area, so there is good cause for further litigation by the Tsilhqot'in for damages. The test for proving aboriginal title has, for the first time, been completed. An aboriginal people must prove continuing and exclusive occupation, and now there is a precedent for doing that. It took the Tsilhqot’in 339 days of trial over five years, with a judge who visited them in their lands, attended night court there, and went so far as to create his own map of the title area. This is a far cry from the Special Rapporteur's recommendation to Canada on this subject. Paragraph 99 of his May report states: "Resource development projects, where they occur, should be fully consistent with aboriginal and treaty rights, and should in no case be prejudicial to unsettled claims. The federal and provincial governments should strive to maximize the control of indigenous peoples themselves over extractive operations within their lands and the development of benefits derived therefrom." Another statement by the Special Rapporteur resonated throughout the judgement: “…the Government appears to view the overall interests of Canadians as adverse to aboriginal interests…” McLachlin talks only about “reconciling aboriginal rights with the interests of all Canadians;” she never describes the task of reconciling the interests of Canadians with aboriginal title and rights. One thing is for certain. The Tsilhqot'in have exhausted the domestic remedy. Indigenous peoples have the internationally recognized right of self-determination - and Canada's overpowering regulation and infringement is a violation of that right. Chief Roger William, Xeni Gwetin, Tsilhqot'in, made a heartfelt statement in a press conference at the Union of BC Indian Chiefs offices in Vancouver, shortly after the Court's announcement. He spoke of how long the journey has been, and how many of the revered Tsilhqot'in Elders who testified during the trial are no longer here to to enjoy the ruling. He gave thanks to them but also mentioned many non-native organizations and acknowledged the importance of their support. “The assertion of crown sovereignty and the denial of First Nation rights is still at the heart of the debate. Somehow the superiority of Canadian instiutions and governments over First Nation institutions and governments is still being based on findings such as “semi-nomadic peoples.” And this somehow means you do not have the same rights as other peoples.” – Robert Morales, November 8, 2013, in Ottawa at public conference after the Tsilhqot'in day in Supreme Court. "The court has declared that aboriginal title exists and that title is not contained to village sites and small tracts of land. "We believe that the high curt has applied common sense and the law to rech this long overdue conclusion. We do have title, it is not extinguished and it extends across our traditional territories," the Chief states." - Secwepemc Nation Tribal Council press release, Tribal Chief Shane Gottfriedson. Grand Chief Stewart Phillip, President of the Union of BC Indian Chiefs, was quoted as follows: "It only took 150 years, but we look forward to a much brighter future. This, without question, will establish a solid platform for genuine reconciliation to take place in British Columbia." The Grand Chief also reported how intervenors hostile to the Tsilhqot'in position pleaded with the Supreme Court judges that "chaos" would befall the BC economy if a declartion of aboriginal title was made. Contrary to the effusive propaganda, the only winners, as usual, will probably be lawyers. "The constitutional law of Indigenous territorial sovereignty is ignored by the decision of the Supreme Court of Canada in the case of Tsilhqot'in Nation v British Columbia, 2014 SCC44. The court held that section 35 of the Constitution Act, 1982, and its own recent decisions discussing that section, has vested in the non-native courts the jurisdiction to expropriate indigenous sovereignty in the public interest..."
"...At all material times since 1876 the Attorney General of Canada has been the architect and implementer of the legal state of affairs under which regime the unconstitutional genocide has been implemented and as to which the judiciary and the legal profession has maintained a steadfast willful blindness. See, for example, Tsilhqot'in Nation v British Columbia, 2014 SCC44. My indigenous former clients, the sovereigntists want their land, not the money..."
"Welcome to Colonial Courtrooms', should have been the title of the Supreme Court of Canada's landmark aboriginal rights judgment. This decision is a death knell for their dreams of sovereignty and the opening bell for a new native land-and -resource exploitation rush..."